Hogg & Davis overhead line tensioners, equipment trailers and utility tools have been the mainstay of quality production tools in the utility industry for six decades. Hogg & Davis products are available via our dealer network in the United States, Canada and beyond. The ODP 40 is a single drum puller capable of line pull or tension of up to 4,000 lbs. Disengaging the drive system allows for free wheel payout of the pulling rope with an integrated hydraulically controlled overspin brake. The OLT 72B Overhead Line Tensioner is designed to install single conductor. The bullwheels are canted as per IEEE specifications to prevent unnecessary twisting of the conductor during installation. Hogg Davis state of the art control console provide critical information about your system. 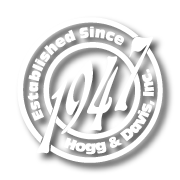 Hogg & Davis products have been made with rugged dependability that utility providers and government agencies have been relying on for 70 years. Founded in 1947 as a partnership by Fred G. Hogg and Willard W. Davis, the company has been designing and building specialized products for the construction of telephone and power lines for seven decades. Incorporated in 1959, the company is still family owned, with second and third generations managing operations. We love to see our equipment being put to the test and doing what it's meant to do. And you are the boots on the ground using our stuff on a daily basis. Let's celebrate your efforts. Post a video or photo using our products and we'll hook you up with some Hogg Davis schwag.